My husband and I are going away this weekend to his work retreat in Big Bear. We've decided to take the Snood along because, I ask you, what could be more fun than spending several days in a small cabin with my husband's co-workers and a teething baby? This means that I need to purchase a portable crib. By my calculations, this simple errand should take me about an hour from start to finish. I'm running way ahead of schedule when I realize that I've forgotten to bring my spinning shoes and must return to the apartment. I get back out to the car and realize that it has started to rain. This, of course, means that every person in the greater Los Angeles metropolitan area will soon collectively and spontaneously lose his or her ability to operate a motor vehicle. I lose another fifteen minutes. Upon arriving at the Target parking lot I learn that it is President's Day, a holiday which seems to have increased the volume of cars attempting to to enter the structure by a factor of six. I lose another twenty minutes. I wait for the elevator and finally manage to make it through the doors of Target at 11:20. I wheel my stroller madly towards the baby furniture section and as I turn the corner, I am met with a veritable miasma of portable crib options. They range in price from forty to two hundred dollars and offer a dazzling array of features!!! But the clock is ticking and I have no time to make an informed decision. 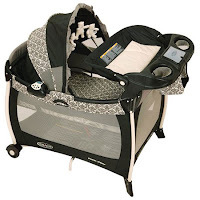 Instead, I grab a crib at random from somewhere near the middle of the pile and lug it with one arm towards the cash registers, accidentally knocking a display over as I try to maneuver the stroller with the other. I reach the cash registers at 11:45am only to realize that the lines are so long that I'm never going to make it to the gym if I try to check-out. I reluctantly decide to abandon my purchase and head for the parking lot empty-handed. Snoods, who has been cheerfully gumming his hands throughout most of this excursion, is starting to get antsy as we get back on the elevator. I run for the car shouting, "Who's mommy's good boy?" maniacally, understanding that the "Y" childcare room will not accept a baby in the throes of a meltdown. We make it to the car. "Why does mommy have crazy eyes?" I manage to make it out of the parking spot, but in the confusion I have lost my ticket. This means that my fruitless excursion is going to cost me exactly twelve dollars. I spend the entire drive to the gym imagining ways in which to bring the Target corporation to its knees - to its very knees!!!! (shakes fist angrily towards the heavens). I arrive at the gym and the baby and I wend our way to the childcare room, arriving at 12:06pm - - - with 9 minutes to spare! Except childcare is full, so I'll have to wait until there's an opening. ...where I have received a parking ticket in the amount of forty-five dollars. I do the only thing I can think of and engage in several minutes of public sobbing before returning home. I put the Snood down for a nap, begin cocktail hour at 2pm and stare at the wall counting the hours until my husband gets home from work (there may, to be honest, have also have been some rocking back and forth and some deranged muttering during this period). Never attempt to do anything. Ever. Look forward to next week's installment - when you'll learn whether or not my husband's co-workers called Child Protective Services when they noticed our child sleeping in a discarded computer box at the foot of our bed!